My thinking about culture begins the moment it is in ruins. Zhang Yimou has been hailed as the most creative and outstanding filmmaker of the Fifth Generation. Zhang and his compatriot Fifth Generation filmmakers (such as Chen Kaige and Tian Zhuangzhuang) were the first post-Cultural Revolution graduates from the Beijing Film Academy (graduating in 1982 this class was labelled the Fifth Generation). They were largely responsible for bringing international recognition to Mainland Chinese films. Prior to the emergence of the Fifth Generation, Chinese cinema was dominated by the production of propagandist films. The Fifth Generation filmmakers challenged the existing system both indirectly and directly; in order to evade censorship, these directors employed the clever use of allegory, symbol and metaphor. In so doing, the Fifth Generation filmmakers have been applauded for their hauntingly beautiful, culturally rich and multi-layered cinematographical language. Red Sorghum made in 1987 was the first film that Zhang directed. His second film Ju Dou (1990) won numerous prestigious international awards such as the 1990 Golden Bear Award at the Berlin Film Festival, the Golden Hugo Award at the Chicago International Film Festival and Best Film at the 1990 New York Film Festival. Ju Dou was also the first Chinese film to be nominated for Best Foreign Language Film, at the 1990 Academy Awards. 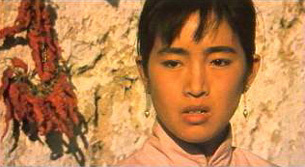 Zhang’s third film, Raise the Red Lantern (1991) won five prizes at the 1991 Venice Film Festival, and was also nominated for Best Foreign Film at the 1992 Academy Awards. Paul Clark, a scholar on Chinese film, writes that the images of China in Fifth Generation films “reflect a profoundly ambivalent nationalism”. This is understandable considering the historical and cultural milieu from which the Fifth Generation filmmakers emerged. This profoundly ambivalent nationalism manifested itself in many of their films including Red Sorghum. Red Sorghum can be aptly described as a film involved in a deep questioning and searching for roots. The film’s concentrated focus on folk culture tells a story – or even a “legend”, as the film itself suggests – of the narrator’s grandparents. The narrator’s obvious Chinese background but anonymous identity seems to imply and encourage a universal, grass roots questioning of the Chinese heritage. The narrator is, in fact, not even sure of who his grandfather is, nevertheless, he likes to believe that it is the character of Grandpa (Jiang Wen), who was one of Jiu’er or Grandma’s (Gong Li) bridal sedan-bearers. Inherent in how this story or legend is constructed is a deep questioning of China’s roots – who and how did our (Chinese) ancestors come about? This questioning of China’s roots and origins is also illustrated in the metaphor of the sorghum – how did the sorghum come to grow in this area (the Northeast of China)? The narrator tells us that no one knows and that it simply grew wildly and naturally. The film’s focus on folk culture repudiates or questions the refined and sophisticated notions of Chinese culture; awakening us to more primal instincts. This sharp attack on traditions is not only seen in the seemingly ludic chant above; but more poignantly in the allegory of the leprous winery owner, who represents China’s obsolete feudal and patriarchal system – which is depicted as impotent and ineffective. The acerbic criticism is made when we find out that Jiu’er is forced into marriage to a leprous winery owner in exchange for a mule – Jiu’er daringly questions her father’s love and even denounces him for such a cruel and callous act. Refusing to be subjected to her ill fate, Jiu’er is only armed with a pair of scissors to guard her dignity; fortunately, the consummation of the marriage never occurs and the leprous winery owner mysteriously dies. The narrator believes that Grandpa is responsible for the death. Jiu’er instead gives herself to Grandpa, who carries her off into the sorghum field and makes a bed out of wild sorghum for her – this is where the narrator’s father is believed to have been conceived. The film blatantly criticises the ineffectual and repressive feudal and patriarchal system of China, boldly awakening and beckoning us to the real and genuine realities of our feelings and primal instincts. Zhang has purposefully chosen this harsh environment for the film, challenging the traditional outlook and established notions of China’s roots. One of the most memorable images in Red Sorghum is found in the last sequence of the film, where we see the mud-caked half-naked bodies of Grandpa and the narrator’s father amongst the corpses. After plotting an ambush and eradicating the Japanese troops, Grandpa and his son (the father of the narrator) are the sole survivors at the end of the film – both these characters’ actual names are never revealed and we are introduced to them simply, almost generically as the nameless narrator’s father and Grandpa, symbolic representations of the Chinese people. The closing images of mud-covered naked bodies and swaying wild sorghum – with folk songs sung as tributes to Jiu’er and the primal beating of the drum – tell us that the characters’ survival and the survival of the Chinese people depend on their ability to shake off the shackles of repression of Chinese culture and return to grass roots. David Neo is currently enrolled as a PhD candidate at La Trobe University; his dissertation topic is magic realism in film.